Welcome to Seoul Central, a K-12 academic program in the heart of Seoul. We are widely regarded as one of the leading international academic institutions in Seoul. Seoul Central International exists to inspire students to develop a passion for learning, the ability to problem solve, and a heart for serving others. With excellence in character and academics, our students have the skills to make a positive impact in their communities for a brighter tomorrow. Seoul Central International is a K – 12 educational community with three levels: Elementary School (K-6), Middle School (7-8), and High School (9-12). Seoul Central is widely known for our purposeful small group design and rigorous American curriculum. Upon graduation, the students will be awarded a graduation diploma and given the opportunity to pursue entrance to American universities. As a highly academic institution, it is our purpose to provide the students with a safe, diverse, and challenging environment. Through our small group environments and closely knit community, the students are able to receive the personalized and genuine support that they need to reach their learning goals. From the beginning, the goal of Seoul Central International has been to develop a program that would challenge young minds to be excellent leaders in their personal lives and careers. It is our desire to provide a quality education that empowers the students to adopt a global perspective and a service-centered mindset. Our heart toward education encourages our students to maintain healthy relationships, retain their experiences, and learning for a lifetime. We offer educational excellence, international diversity, and commitment to educating the leaders of tomorrow. and Next Generation Science Standards. Seoul Central International is a Candidate for Accreditation. This will be our 2nd year in the WASC program. Approved by the Accrediting Commission for Schools, Western Association of Schools and Colleges. Seoul Central International is a full member of Korea Council of Overseas Schools. 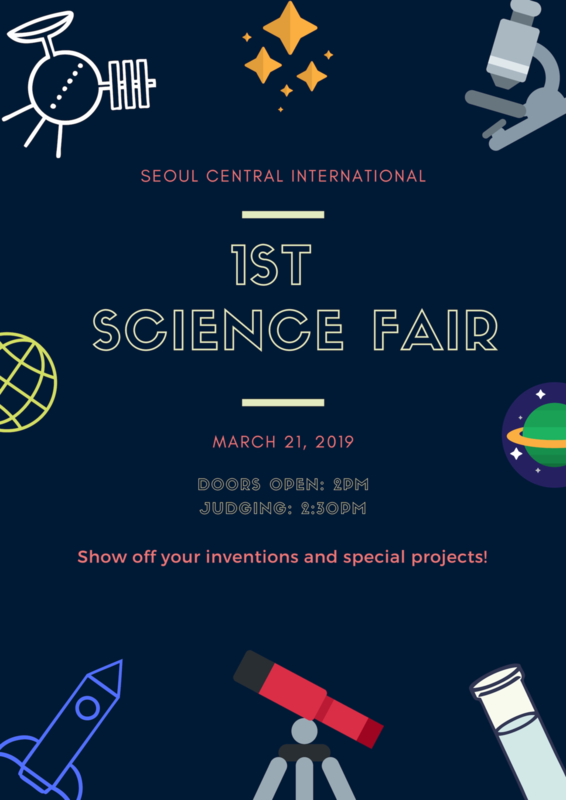 Join us for the first Science Fair in Seoul Central history! Welcome to SCI! We are pleased to welcome you to our encouraging and challenging learning community. At SCI, students are supported by caring teachers that help them reach their learning goals. The students and faculty at Seoul Central are motivated to bring their best efforts every day. Our heart toward education empowers our students to maintain healthy relationships and retain their experiences and learning for a lifetime. We offer educational excellence, international diversity and commitment to educating the leaders of tomorrow. Inspiring excellence in academics and character! Seoul Central International exists to inspire students to develop a passion for learning, the ability to problem solve and a heart for serving others. With excellence in character and academics, our students have the skills to make a positive impact in their communities for a brighter tomorrow. We hope to provide a program that would challenge young minds to be excellent leaders in their personal lives and future careers. It is our desire to provide a quality education and share a global perspective and service-centered mindset with our students. graduate high school and pursue entrance to American universities and colleges. Congratulations and best of wishes in university! Founded by Karen Her and Sean Yu, hoping to raise upright citizens that truly pursue their passions. With humble beginnings, Seoul Central started the fall of 2016. In 2017, Seoul Central relaunched under new leadership and renewed vision. Now, we at Seoul Central, we are a K-12 academic program in the heart of Seoul. We are widely known as one of the leading international academic institutions in Seoul. We are a non-profit organization where 100% of your tuition directly impacts student learning. We offer educational excellence, international diversity and commitment to educating the whole child to be upright leaders of tomorrow.